Sometimes, it's best to go with the flow. Ward off the chill with the top liquor trends this season. It's the coldest time of the year, and the moments you most look forward to are the ones spent sprawled in front of a fireplace, caressing a glass of iced whisky. Or, if you are the partying kind, dunking in a little liquid courage to ask that pretty lady onto the dance floor and eventually wrap up the wintry night with enough warmth to keep you going till March. 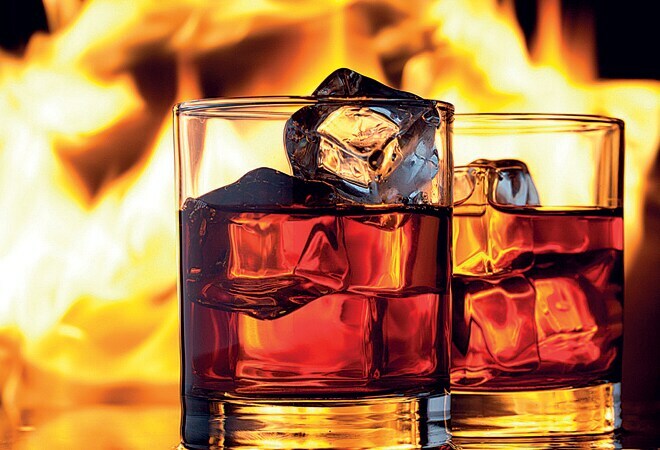 Ask any drinker, and he will tell you that good liquor is best savoured when there's a chill in the air. Alcohol has always played bedfellow to the cold, whether it involved top-hatted American gentlemen discussing politics over jugs of moonshine in 18th century speakeasies or furry St Bernards gambolling around with brandy barrels in medieval Switzerland to rescue pilgrims stranded in the snow. But before you raise that toast to the winter, here are some liquor trends you should look at. After all, there's more to drinking than, well, just drinking. At a party, don't let your jaw tumble to the dance floor if your woman friend asks for a whisky on the rocks. Chances are, you will come across as somebody out of tune with the times, or worse still, a male chauvinist. Gone are the days when women opted for gin and tonic; today, they love the golden stuff as much as the next man. The clearest indication of such a development is the record number of women joining the Scotch Malt Whisky Society, an international organisation dedicated to promoting the liquor. The Indian woman is no exception to the rule, either. Says Pushpanjalee Banerji, Kyndal India brand manager and the most visible woman in the Indian liquor industry today, "Whisky had a very masculine image for a long time, but times change. Women want to experience new things that have hitherto been considered 'male'. Today, both men and women raise their whisky glasses at social gatherings. I have witnessed this transition firsthand." While we are on whisky, why don't we take a break from Scottish offerings (good as they are) to treat our higher senses to a little experimentation? Try some Irish whisky, for instance, the sales of which grew by as much as 10.1 per cent across the globe in 2013 despite a relative slowdown in alcohol consumption. And going by its newfound popularity, an increasing number of bars across the world have begun stocking Jameson Reserves alongside their Dalmores and Glenfiddichs. Experts attribute the Irish whisky's popularity among new-gen drinkers to its smoother, sweeter flavour, brought about by a three-pronged distillation process. Care for something closer home? Try Japanese whiskies, especially the Yamazaki Single Malt Sherry Cask 2013, which bagged the top honours in the latest edition of Jim Murray's Whisky Bible. Whoever said drinking is injurious to your health may just have to gulp down his words. Studies show that an increasing number of people are taking to alcoholic beverages spiked with vitamins and all-natural ingredients such as goji berries and ginseng. Beer, for its part, has now come to be known as one of the healthier options on the drinks menu; a 12-ounce serving of craft beer is said to provide around 8 per cent of the recommended daily intake of vitamin B6 and niacin, 5 per cent of riboflavin and folate, and trace amounts of other important nutrients. What's more, the newer crop of experts do not hold much stock in the 'beer belly' myth either. "Overconsumption of any liquor causes obesity. Believe it, an average pint of beer has fewer calories than a rum and coke," says Rohan Jelkie, wine and spirits professional with Tulleeho. It makes little sense to survive on salads and salted lemonade all week long, and then throw it all away on a greasy Mudslide on a carefree Saturday evening. Taking this logic forward, many now opt for low-calorie cocktails that ensure a great high with loads of flavour but a smaller possibility of love handles. So, to keep up with these weight-conscious times, make sure you don't stray anywhere near the Chocotini and the Long Island Iced Tea. After all, why go for sinful drinks when healthier options like the Apple Martini and Bloody Mary notch up a calorie count that barely crosses triple digits? As much as you may like your beer or whisky, this is the season to experiment. With the entry of Japanese sake brewers Masumi in February and the recent bottling deal by Korean soju giant Jinro with Advent Brand House, there is a sudden spurt of interest in East Asian liquor. However, don't glug this stuff straight from the bottle; soju and sake are meant to be had as part of a social gathering, and with utmost respect for the spirit as well as those around you. Seven among the top 10 fastest growing whiskies in the world, led by Radico Khaitan's Crown at 75 per cent, are Indian. Officer's Choice, with 23.8 million cases, sold the most in 2013. Traditional drinkers still outweigh the adventurous. While 36 per cent stick to the same ol' scotch-n-soda, just 32 per cent want to know what that new drink is all about. The rest say they can swing either way. Non-alcoholic beers and wines are on their way out. If they don't feel like getting a high, customers would rather have a big mug of natural fruit juice. It's healthier too. The cocktail may have found its origin in bathtub gin, but it has mostly been hanging in vodka territory ever since. What's more, it's still going strong.